Today was so much warmer, we were talking about it being distinctly balmy at the barn. A degree over freezing!! Break out the bathing suits? Driving home, the sun was shining from one part of the sky and snow was sifting slowly down through the branches of the trees next to the road. The snow was stuck to the tops of all the branches too, so everything was strongly shaded, bright on top, deep dark wet bark colored below. 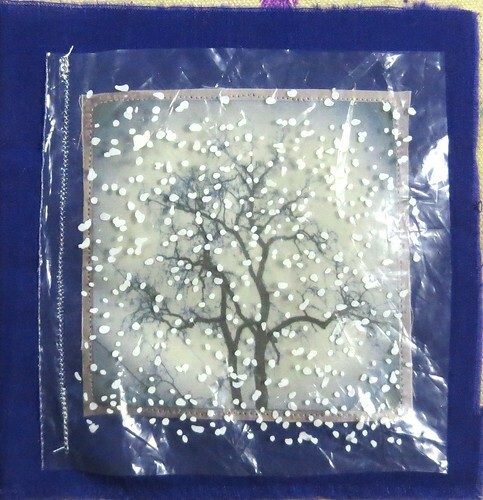 I tried two layers of plastic bag for this one, with white paint dotted onto each layer. Margaret very kindly offered a series of useful suggestions for snowflakes, including paint, gesso, glitter glue and toothpaste. I'll try gesso and a toothbrush tomorrow, but probably not toothpaste because it is water soluble.
. . . I was joking about the toothpaste . . .